Hi there, I'm a newbie! It's my first post..
What i want to say must have been mentioned, but anyway..The fact that in the videos(second hit) the penetration of the plane and the explosion are occurring at a sequence and not at the same time provides a fail safe. Accepting the consensus of the forum that video cameras were electromagnetically 'jammed' during the approach of the 'planes', only one measure is necessary to avoid screw ups..
To ensure that someone will not capture the explosion(which in my opinion was a true event, as it is pictured from every video angle exactly the same, only the damage control of the 'nose out' had some 'necessary' alterations) with a high-zoom lens photographic device from far away during the supposed 'penetration', without a plane, with the explosion looking identical! My point is, that since videos were undeniably faked (the plane on the second hit hasn't got the shade that it should on it entering the tower and that is just ..undebunkable), the only way to ensure that no one spoils the show is to have the penetration and the explosion as two separate events..and of course to have nothing else hitting the towers, because it COULD be photographed , somehow. No risk, when the stakes are so huge.. The explosion had to be real in my opinion, because, if so many in this site claim, that the 'perpetrators' screwed up the buildings perspectives and even the trajectories of the planes, imagine how much they would have screwed up the explosion, which propagates in milliseconds and must look identical, from every direction every millisecond..And it did. Only the 'nose out' spoiled that, to a minor degree.. Anyway, just my two cents. Hi to everyone! P.S: Ι didn't provide links because I'm referring to the majority of videos, regarding the second hit. As for the shadows missing on the plane entering, you all have seen 'Enlighting The Shadows' (http://www.youtube.com/watch?v=Pjb8RLMoKS0) on YouTube..i guess.. Thanks for the brave contribution. I don't mean to diminish what you said but particle effects can simulate gaseous explosions in 3D without concerns about discrepancies between different angles. In my opinion, nothing in the video is real, but I wouldn't be surprised if they used a real pyrotechnic event at some point. In any case, it's hard to say what really went on behind the digital video, but your speculation is appreciated. hoi.polloi wrote: Thanks for the brave contribution. I don't mean to diminish what you said but particle effects can simulate gaseous explosions in 3D without concerns about discrepancies between different angles. In my opinion, nothing in the video is real, but I wouldn't be surprised if they used a real pyrotechnic event at some point. Thanks for the response. Yes, the explosion is possible to simulate perfectly, and the whole thing was possible to simulate perfectly(you just have to rotate the computer animation), but since they mixed up the perspectives of buildings and the planes trajectories, i just deduced that the one thing they didn't screw up could be true..
Plus, there is a risk with screwing up the explosion, because it is large, and can be photographed from a distance, i think it must somehow correspond..Anyway. Also, it is noticeable that the plane appears pitch black in most early 'depictions', which of course shouldn't be the case since even objects in shade, have distinguishable colored parts, just less vivid..
And, the hole in the building, at the left side has clean cuts on the columns, not at the bolts, but at the length of the column, which is simply impossible physically, because that is truly a case of the hardness of aluminum vs steel..The momentum can only be considered when the columns disconnect at the bolts.. So, i agree with the basic statement of the forum that there was video fakery..To what extent i'm not sure..
mondrose wrote: Plus, there is a risk with screwing up the explosion, because it is large, and can be photographed from a distance, i think it must somehow correspond..Anyway. Are you absolutely sure there were any explosions up near the tops of the buildings that could be seen from afar? What if the smokescreens went up before either building showed any effects of anything? If the images/videos are fake, you can't draw any conclusions from them at all. Yawn. With poor readability like your posts and the "points" you make, I'm glad I've banned you. You just haven't looked at the imagery enough to understand it is fake. To all those who believe the "planes" were genuine and were able to make a mockery of crash physics by slicing through the towers as if they were made of butter while at the same time retaining their wing tips and tail-sections,keep your eyes open,for in a few days time Santa and his reindeers are about to perform yet another "miracle" in the skies above....or is that something only a child would believe. I asked a professor of physics for formulas how to calculate the penetration of that plane through a steel frame building, and why the imulse didn't make the plane squeeze. So is there no calculations done yet, how it works with impulse or power with the materials of the objects? Is there any computer simulation which uses attributes like material and real physics engine? Been asking this question since day one! LS-Dyna was used to create the "Rutgers Simulation" but they didn't publish the values they to plugged into the program that made sheet aluminium slice through the steel spandrels and several acres of concrete! You'd probably need to be an engineer and or physicist to use it properly! Here is John Lear, son of the inventor of the Lear Jet giving his views that no planes hit the buildings. MrSinclair wrote: Here is John Lear, son of the inventor of the Lear Jet giving his views that no planes hit the buildings. 9/11 has been a web of lies all interconnected, one lie to justify the other... hijacking planes; taking control of them; reaching impossible speeds; aiming the targets; penetration past the steel columns; fuel burning inside the towers; collapse; rubble; asbestos etc etc. If you start pulling one all the lies come out. Which is a problem, paradoxically, because this makes the force of denial in the public conscience much stronger. A denial that can only hold on to the media and what they have said and shown. Those are the "strong" points. People are ready to admit governments lie -- but not to admit that the visual artifices of the media can be faked. Wow, great find! I am going to repost this in the thread. of aircraft in 60 different countries around the world. I retired in 2001 after 40 years of flying. 6. I hold 17 world records including Speed Around the World in a Lear Jet Model 24 set in 1966 and was presented the PATCO (Professional Air Traffic Controller's Association) award for Outstanding Airmanship in 1968. I am a Senior Vice-Commander of the China Post 1, the American Legions Post for "Soldiers of Fortune", a 24 year member of the Special Operations Association and member of Pilotfor911truth.org. H. The debris of the Boeing 767, as found after the collapse, was not consistent with actual debris had there really been a crash. Massive forgings, spars from both the wing and horizontal and vertical stabilizers, landing gear retract cylinders, landing gear struts, hydraulic reservoirs and bogeys oxygen bottles, a massive keel beam, bulkheads and the wing box itself cold not possibly have 'evaporated' even in a high intensity fire. 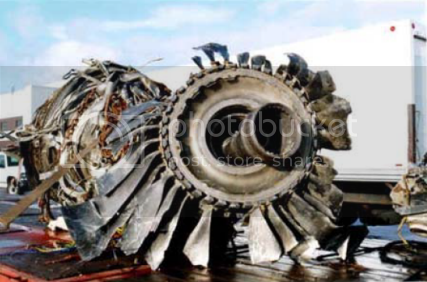 The debris of the collapse should have contained massive sections of the Boeing 767, including 3 engine cores weighing approximately 9000 pounds apiece which could not have been hidden. 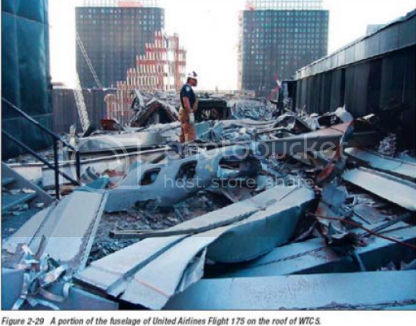 Yet there is no evidence of any of these massive structural components from either 767 at the WTC. Such complete disappearance of 767s is impossible. He would also have to control his altitude with a high degree of precision and at the alleged speeds would be extremely difficult. 13. In fact VD of 420 knots (483 mph) is a speed that is a maximum for certification under 14 CFR Part 25.253 High Speed Characteristics and has not only not necessarily been achieved but is far above VFC (390 kts. 450 mph) which is the maximum speed at which stability characteristics must be demonstrated. (14 CFR 25.253 (b). 16. We have two other things to consider: induced power and parasite power. Parasite power however varies as the cube of the velocity which means to double the speed you have to cube or have three times the power. So achieving an airspeed much over its Vmo which is 360 knots isn't going to be possible coupled with the fact that because the parasite drag increases as the square of the speed and the power required increases as the cube of the speed you are not going to be able to get the speed with the thrust (power) available. 22, To propose that a Boeing 767 airliner exceeded its designed limit speed of 360 knots by 127 mph to fly through the air at 540 mph is simply not possible. It is not possible because of the thrust required and it's not possible because of the engine fan design which precludes accepting the amount of dense air being forced into it. For me that was a great read. It’s very rare I’m optimistic about any 9/11 research outside media fakery, or this forum. 1-Can a Commercial Boeing 767–222 as 443 mph (385 kts. M.6, American Airlines Flight 11) and 542 mph (470 kits. M.75, United Airlines 175) be “piloted or auto piloted” at these speeds at 1000 feet. No Boeing 767 airliner(s) exceeded 500 mph in level flight at approximately 1000 feet on 9/11 as fraudulently alleged by the government, media, NIST and its contractors because they are incapable of such speeds at low altitude. The maximum permissible speed of the Boeing 767 below 23,000 feet is 360 knots and it is safe to operate the airplane at that speed but not faster. The real question is can that amount of thrust be extracted from it at 540 mph at 800 ft.
To propose that a Boeing 767 airliner exceeded its designed limit speed of 360 knots by 127 mph to fly through the air at 540 mph is simply not possible. It is not possible because of the thrust required and it's not possible because of the engine fan design which precludes accepting the amount of dense air being forced into it. Its takes a highly skilled pilot to interpret the "EFIS" (Electronic Flight Instrument Display) display, with which none of the hijacker pilots would have been familiar or received training on, and use his controls, including the ailerons, rudder, elevators, spoilers and throttles to effect, control and maintain a descent. The Boeing 767 does not fly itself nor does it automatically correct any misuse of the controls. Assuming, however, that the alleged hijacker was able to navigate into a position to approach the WTC tower at a speed of approximately 790 feet per second the alleged hijacker would have about 67 seconds to navigate the last 10 miles. During that 67 seconds the pilot would have to line up perfectly with a 208 ft. wide target (the tower) and stay lined up with the clacker clacking plus the tremendous air noise against the windshield and the bucking bronco-like airplane, exceeding the Boeing 767 maximum stability limits and encountering early morning turbulence caused by rising irregular currents of air. In addition to this the control, although hydraulically boosted, would be very stiff. Just the slightest control movements would have sent the airplane up or down at thousands of feet a minute. To propose that an alleged hijacker with limited experience could get a Boeing 767 lined up with a 208 foot wide target and keep it lined up and hold his altitude at exactly 800 feet while being aurally bombarded with the clacker is beyond the realm of possibility. Hijacked / Drone Boeing 767, Fairytale is well and truly busted…. 9/11 was not “Top Gun”, With F-16 style 767 jets with “Goose and Maverick” at the helm,not buzzing the "Towers" at the speed of sound, doing 360 degree a second banking barrel rolls. All the so-called planes are / is Pre-fabricated CGI Animations made in a studio. That's over 4 years old. I've never heard of Mr Lear. AmongTheThugs wrote: That's over 4 years old. I've never heard of Mr Lear. In my opinion I do believe not really entirely relevant. The two questions (Speed at 1000 feet/and banking 12degrees) that need to answered are very close if not 100% answered in that PDF. I am not an expert in VE and VMO but from what I have researched before. I do believe that the maximum out put required to fly a 767/200 at 540 mph @ 1000 feet and also bank is not possible by a human or drone.